Sole Mare - Just Beauty Products, Inc.
Alfaparf Bi-Phase Sole Mare, guards chemically processed hair from the harsh effects of the sun, salt and chlorine. Leaves hair feeling silky-soft and glossy, while its moisture-replenishing shampoo cleanses hair without over stripping, removing all traces of salt, sand and chlorine while nourishing the capillary fiber. Sole Mare There are 6 products. 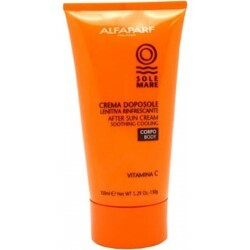 Alfaparf Sole Mare After Sun Cream 5.29 Oz. 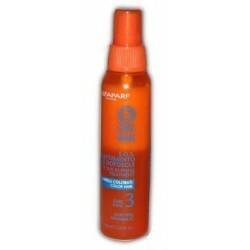 Alfaparf Sole Mare After Sun Cream 5.29 Oz. Refresh and nourish your skin with this ultra-hydrating body cream. Alfaparf Sole Mare After Sun Moisturizer Icy Cool Effect Body 8.81 Oz. 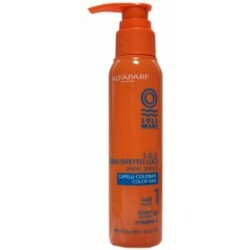 Alfaparf Sole Mare After Sun Moisturizer Icy Cool Effect Body 8.81 Oz. Moisturizing fluid, the ideal product after a long exposure to the sun its exclusive "Ice Effect" is specifically formulated to guarantee an immediate and long lasting cooling sensation to sun stressed skin. Alfaparf Sole Mare S.O.S After Sun Bi-Phase Treatment 3.38 Oz Phase 3. This restructuring leave-in treatment revitalizes chemicalli processed hair after sun exposure and swimming. 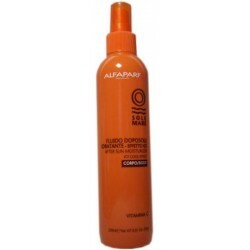 Alfaparf Sole Mare S.O.S Creamy Shampoo Color Hair 5.29 Oz. Phase 2. This moisture-replenishing shampoo cleanses hair without over stripping. Its soft creamy lather removes all traces of salt, sand and chlorine while nourishing the capillary fiber. Alfaparf Sole Mare S.O.S Kit Week-End Color Hair. This restructuring shampoo and leave-in treatment revitalizes chemicalli processed hair after sun exposure and swimming.